I gotta tell you. Sometimes I’m just as grateful for the gift of vinegar as I am a beautiful sunrise. I can use it medicinally, to clean without the chemicals, to preserve foods, and to season. It’s also a GREAT weed control too. As soon as I find it in 5 gallon drums I’m likely to buy some. Hee hee But, anytime I find myself “loving” something that much, I have this crazy instinct which prevents me from fully enjoying something unless I’m able to answer the question “how can I create this from scratch?” (I’ll never be held hostage by Hostess again! That was just too traumatic. *grin*) I’m talking about making real vinegar made from scratch, not that flavored vinegar that you make from leftover wine. Soooo, just in case there are any other crazy people like myself out there who have embraced the virtues of vinegar I thought I’d try and save you from doing without someday by turning you on to the fact that yes, you can make your own vinegar from scratch. You can make malt vinegar, balsamic vinegar, apple cider vinegar, red wine vinegar, and just plain white vinegar. Frankly, there’s just an awesome amount of peace that I get knowing that I don’t have to rely on transportation, electricity, or Heinz to run a profitable business. I love knowing that “I do it my-seff”, as my adorable niece used to say. And so can YOU. What I’d like to accomplish today is A) The encouragement to venture into this fun activity so you can enjoy chemical free cleaning, medicinal benefits, culinary craftsmanship, and a little lawn care. B) Provide you with the basics that you’ll need on hand that you can obtain now just in case you’re inclined to put off learning how to make vinegar for now but still want to make sure that you at least have all of the necessary supplies. Fortunately, you’ll find this process relatively simple. Time is your friend mixed in with the occasional, brief tending steps. The vinegar making process uses the similar fermentation process as used in winemaking—in fact, technically speaking, you’ll pass the “wine” stage by the time youget to the finished vinegar product. This is why you’ll find that the “cooking wines” offered commercially strongly resemble the smell of flavored vinegars. It’s also why I giggle a little bit when I have friends who are horrified when I use a little cooking wine in my cooking. If they only knew that a finished dish that uses wine in it has the same finished result that you get when you use vinegar. The alcohol is burned off in cooking and it ferments out during the vinegar making process. 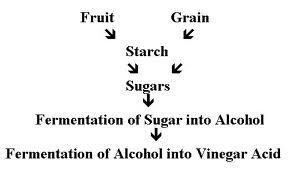 The key flavor that you end up with in the vinegar making process is the acetic acid. (ranging from 5 to 18%) tartaric acid and citric acid. Next, don’t make the mistake of using any metal instruments in your vinegar making process. 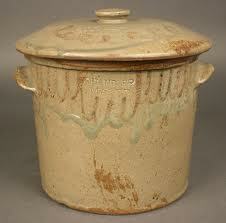 I prefer a 2 gallon, wide mouth clay crock. (Minehas a spigot on it). You’ll want it wide-mouth so that you can tend to the fermentation process unencumbered. If it were me, I’d even stay away from stainless steel and cast iron. I’ve had something go wrong every time I use anything remotely metal. So stick to clay, glass, or ceramic. You could even use a wine barrel like they used to eons ago. Next, stock up on that sugar; it’s critical to creating your alcohol. Most people look at my sugar stash and think that I just plan on having a sweet tooth through years of thick and thin, but in actuality I look at my sugar stash as my vinegar stash. You could also stock up on sugar beet seeds and make sugar from the sugar beets, but you can actually cut some corners and make alcohol directly from the sugar beets by using a fermentation process, but that’s a whole ‘nother story. You’ll also want to make sure you have plenty of cheesecloth. Straining and squeezing is a common part of making vinegar (and a myriad of other nutritionally valued foods). I purchase my cheesecloth by the yard online. I like to have a fine mesh and a good, hearty weight. Just do an internet search on “cheese cloth by the yard” and you’ll find current options. I only purchased it twice in 8 years, so I’m not up to date on what’s the best resource out there today. Once you get the basics down, I wholeheartedly encourage you to experiment with fabulous flavor creations. I’ve found that just the right flavored vinegar, such as a fig infused balsamic vinegar, to be just the right touch to make a sprout salad perfect! And I’ve made a wide variety of dishes that would be perfect if only I could add just the right touch of a tasty acidic level. Learning the skills of making vinegar can also transform leftover wine from a waste to a great resource. I constantly encourage people to learn a skill that would be useful in a “society down” scenario—you know, in the event that our currency becomes useless, or a long-term power outage knocks us back to the 18th century. Learning how to make vinegar would be a very valuable skillset with a universal appeal. So, give it a try. You never know. It just may end up providing your family and friends with necessary food and shelter. Love this post! Thank you ... I am going to try it... eventually. ha ha .. You have a way of convincing me I can. I'm really fussy about not getting any wrong bacteria when I make wine (and no, I never have any left over) so taking it to the vinegar stage shouldn't be to difficult (other than not drinking it when it gets to the wine stage). I use vinegar as a fabric softener (it also keeps lime scale from building up in my washing machine) and as a hair conditioner, and I use it for cleaning so I use at least a gallon every other week (lots of kids so lots of laundry and gross bathrooms). Not that it's expensive, but I think it would nice to be able to make my own if I can't get it anywhere else. So I have some books to purchase and some vinegar making to try (don't drink it don't drink it). Thanks again, Kellene for the great ideas! One of the most useful articles you have ever come up with and shared. Thank you! As always, best prep site out there. Please keep it up. You did it again!! I have been researching and researching making my own vinegars because I found out that distilled white vinegar is made with CORN.. EVIL CORN is very bad for my daughter. So I am using what white vinegar I have for cleaning (15 gallons to go) but for cooking I am using ACV (apple cidar vinegar) or rice vinegar or red wine vinegar. I am waiting for the fall to make the cidar to make my own ACV. Some of the people say to use an alcohol to start, but what many don't know is that many alcohols have stuff added to them so they won't turn to vinegar. Nice article. Sharing to my blog! Have a question do you think a ceramic drink dispenser with a glass lid like the one here (edited for possible spam) would be a good choice to make vinegars? Anything that's not metal or plastic will be fine. Thank you Kellene. I am very interested in trying my own vinegar. I read another article about how to do it (before yours) and it sounded complicated and extremely fussy. Is it hard to get everything just right? They talked about how dangerous it is to introduce the "wrong bacteria" into your batch. Their article kind of scared me and put me off to the whole idea. If you feel it is safe as long as you are super clean then I will try it. Have 6 gallons of Pinot Grigio that has gone sour. So with some mother, transfer to a wide mouth gallon container and a dark place I can expect vinegar in about six months? Just trying to decide if I should pitch the entire amount. I would say Yes, Bob. There are still medicinal values in that too, just FYI. It won't taste amazing, but still beneficial in that regard. But yes, by all means turn it into vinegar. 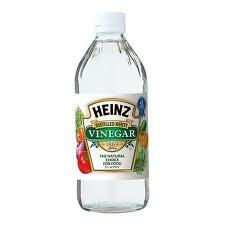 I have been thinking of making my own vinegar and you make this process sound pretty easy. The glass containers with spigots that I have been looking at to make and age my vinegar all have spigots made of plastic. Will that affect the vinegar? In my book, yes, it will. I know the frustration VERY well of looking for non-plastic spigots. At the very least, you can find BPA free spigots though if you opt to choose the plastic spigot route. how do you know or control the acid level in homemade vinegar? most recipes call for 5%. how does vinegar from apple juice compare to vinegar from apple peels in water? The apple juice vinegar is much less bitter than the vinegar from the apple peels. But the apple peels vinegar is better for you.